The daughter of my mother's best friend shares a birthday with me, so our families spent a fair amount of time together while I was growing up. 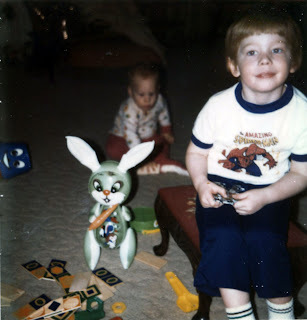 Not long after my younger brother was born, though, I found myself bored at their house. After all, the adults were focusing on the baby and I couldn't entertainment myself by playing with Brooke's girlie dolls. 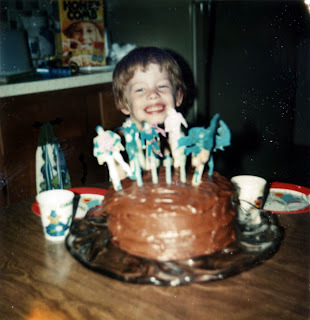 (Cut me some slack; it was the '70s and gender roles were still pretty rigidly defined.) So I was given a small stack of comic books to occupy me/keep me out of trouble. 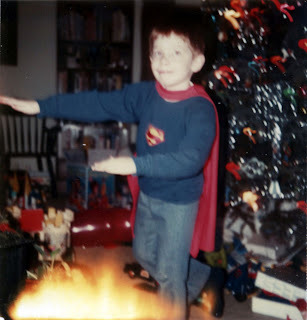 Clearly, by my fourth birthday, I had become quite enamored with superheroes. 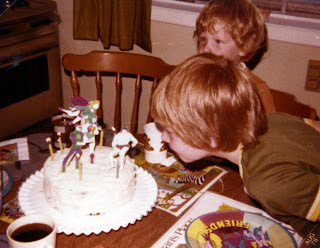 The cake decorations here were drawn by father, copied from various comics from that initial pile I was give, cut out on card stock, and held in the cake via popsicle sticks. The flash washed out the figures, but you should still be able to fairly easily discern Robin, Green Lantern, Superman, and a classic Neal Adams pose Batman. I believe that's Flash between Supes and Bats. Same birthday with me showing off some of my haul... "I'm Goddamn Batman!" Hmmm. Not as powerful as when Frank Miller uses the line, for some reason. The mask, I believe, I had previously judging by the obvious rip in the paper. And for those who might question why I'm pretending I'm Batman while wearing a yellow plastic raincoat... That's Mom on the left, FYI. 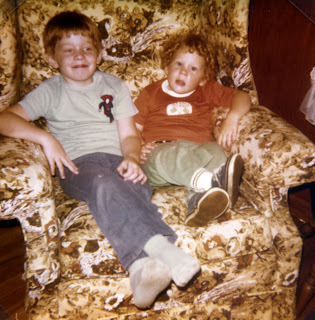 I'm not sure exactly when this next photo was taken, but it looks like a trip to Grandma's house where my brother and I were actually being good. 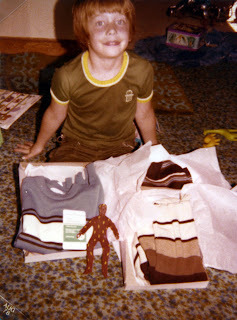 Note the Superman patch on my shirt. OK, let me try this again... "I'm Goddamn Batman!" Still not working, is it? 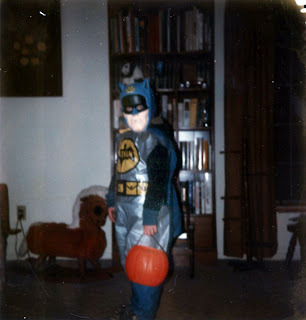 That's me on Halloween 1977. May 1978... 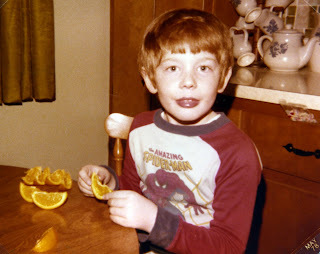 I have no clue about this photo's context, but it's clearly me eating an orange while wearing a Spider-Man shirt. Then we have my birthday. Dad used the same figure cut-out as decoration idea from a few years earlier... As I study that picture more closely, I'm pretty sure that's actually a second cake that Grandma brought by some time after the initial celebration, and Dad re-appropriated some of the figures from the "primary" cake to decorate this one. Birthday gifts from the folks. 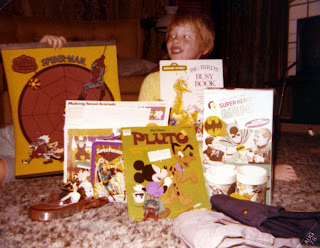 You can see a Spider-Man velco dart board, a Batman mug set, and a Super-Friends lunch box. The dart board strikes me as particularly interesting because it's co-branded with The Electric Company, which partially explains the discrepency in art styles between the Romita Spidey and the cartoon villains. 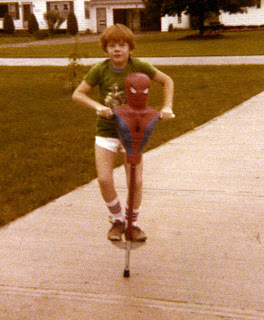 I don't know exactly when this next shot was taken... ... but I'll bet you didn't know that anyone ever made a Spider-Man pogo stick, did you? Another birthday. I believe this is 1980... Look closely. I'm wearing Hulk pajamas. You can just about discern the basic pose and part of the logo. 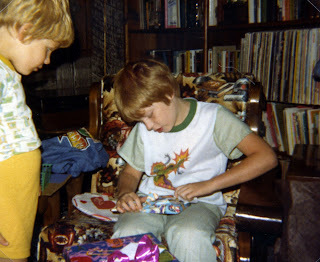 I remember coming home from school one day and playing in the yard for an hour or so before realizing that I somehow managed to get dressed without removing these pajamas at all. I spent the whole day wearing my PJs underneath my school clothes, just like a superhero, and I hadn't even intended to do it! In the summer of 1982, we had our first significant family vacation (that I recall at any rate) and my folks took us to Florida. The shots of me at Disney World have me sporting a t-shirt with some cartoon mouse on it that I can't quite recognize, but we also hit several other tourist spots as well. 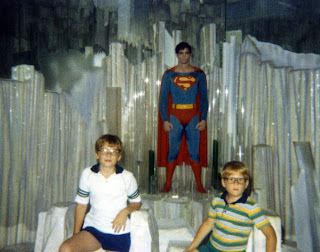 This is a wax recreation of Christopher Reeve as Superman in his Fortress of Solitude from a museum of Hollywood icons... I recall that the only other exhibit there that I recognized was from The Wizard of Oz. Same trip. 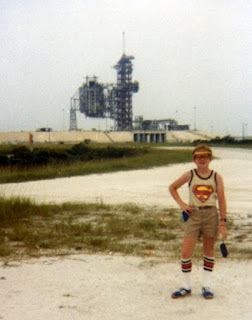 The NASA Space Center... Tube socks? Check. Cheap, bulky camera dangling from my wrist? Check. Tinted plastic sun visor? Check. Fanny pack worn on my hip? Check. It's frightening to think that the Superman tank top is the only thing that doesn't make me look exactly like a stereotypical tourist. 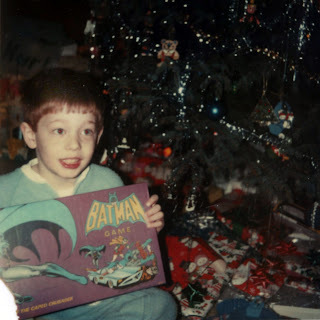 And there you have the TRUE origin of Sean Kleefeld, comic book fan. Sean--Neat post. I am loving the Batman bike! 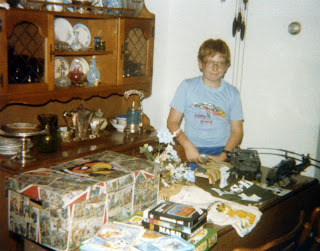 We're probably separated by a few years but I recall owning the most awesome plastic Batmobile with push pedals. I was four or so (which would make it 1980) and it had a little plastic CB for me to talk to Alfred and a bat-shaped steering wheel and everything. I have searched in vain for pictures of it online, but trust me: It ruled. Much like that bike.